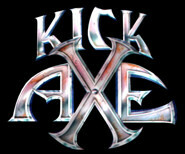 Welcome to the Official Fan Site (since 01/12/2002) of the Canadian rock group Kick Axe (thanks to the kind permission of the members of the group). Main purpose of the site is to cumulate information about this group and made it public. If you have any information that I miss here and you are willing to contribute to this site, please, feel free to send it to my e-mail. I will use your material exclusively to replenish this site and make it available to all the internet users. Recently I have made an update in a graphical way so I hope you will like it much more than it was in the past and also there has been a massive information update. Created using the sources of: Canconrox (Dan Brisebois), The Canadian Music Encyclopedia (Jaimie & Sharon Vernon), The Immaculate Deception (Sherman Ross), The Transformers Un-official Fan Site, Bryan Reesman, Garry Sharpe-Young, Tim Lawson Official Website and Kick Axe Official Website. Special kudos to: Fred Nohels, Cyclonus, Kevin Medwed, Uwe Gladasch, Rod Dysinger, William G. Forrest, Matt Wilcoxson, Rene Engelaan, Nathan Atkinson, Terry Millin, Gord Newman, Alain Robert, Erik Grove, Dana Felix, Duane Roy, David Campbell, Klaus Gebhard, Jr., Joey Bolt, Rik (Eargasm Records), Mike J. Baker, Urban Wallstrom, Johan Hagman at Lee Aaron European Fanpage, Jamie Handshoe, Patrik Land, Martin Bonnie, Todd Midtvedt, Paul Mercer, Scott McElroy, Spencer at Mindbender Music, Erling (Rockdoc), C.A.Barber, John Meert, Marcelo from Brasil, wrinkles@cedar-rapids.net, Kurt Neis, Roger Riveland, Rik Fedyck, Andrew Matte, Jamil Ahsan, Shannon Scott, Michael Cooke, Richard Savoie, Chris Schild, Mike Baker and Silvia for their contribution to this site.